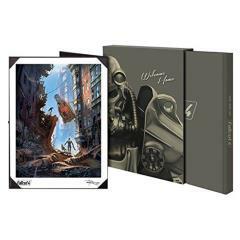 The Art of Fallout 4 is a must-have collectible for fans and a trusty companion for every Wasteland wanderer. Featuring never-before-seen designs and concept art from the game's dynamic environments, iconic characters, detailed weapons, and more - along with commentary from the developers themselves.Limited Edition of 5,000, exclusively for the Bethesda Store! - Collector's Edition of the Book, with an exclusive 16 page image gallery - Portfolio Featuring an exclusive print - Deluxe slipcase for storage and display - Free digital copy of the book - 382 total pages, which includes a 18-page Concept Art Gallery Section only available in the Limited Edition!